You are here:Home » Product Reviews » Be The One To Win A Mysterious Prize! Hey, words are getting around fuss & furious. I’ve just received mine. Have you gotten yours yet? They’re colourful & come in all shapes & sizes. Durable, sturdy & help you put your daily essentials in place. Yap, I’m talking about the latest Bag Organizers! Gone are the days of ransacking through your bags for your stuff & no more mess from leaking pens etc. Bag Organizers carry & store all bag necessities, making it easy to switch bags without clearing your things. This sturdy organizer has pockets that will fit your daily essentials, keeping everything in place. Guys, you’re not left out either. Bag Organizers are especially handy for backpacks too. No more digging into your sack just to find your novels, gadgets etc. Check out how I organize my stuff & easily switch from one bag to another. Left pockets: Glasses & beloved Mont Blanc. 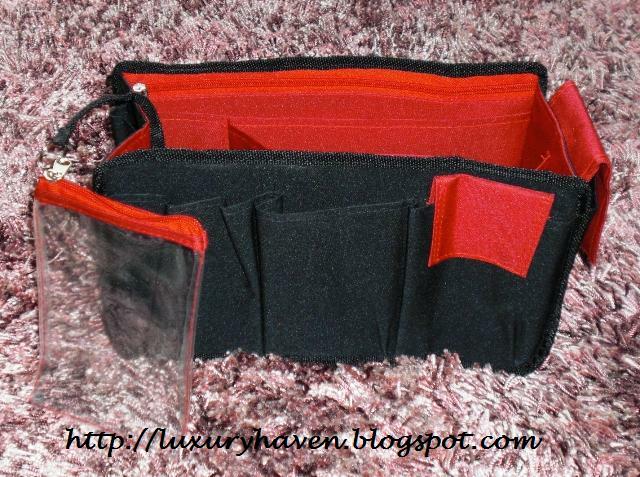 Front: Name card holder, key pouch & ear-phones. I chose the L-size to fit into my LV Neverfull MM & it’s a perfect fit. Let me see how easy it is to switch my stuff from one bag to another. I love backpacks but it’s always a hassle to look for stuff. Now I can just grab the whole organizer & slot into another bag. Bingo! It fits perfectly into my LV Montsouris backpack, measuring 12" (L) x 15" (H). Now I can simply put my cardigan on top of it without having to search for my essentials below. So what’s the price of this stunning organizer?? This classy item from Smoocholito costs only S$24.90! Go to Smoocholito profile in FB to ‘ Like ’ the page. Click on ' Photo ' tab, then ' Birthday Contest ' album. Click on my pix (wearing army-green t-shirt) & click on “Like” again. Check to see if your name is there once you've clicked the "Like" button on my pix. If you name's not there, it means you've not done it correctly. Your name needs to be there to be entitled for the lucky draw!! Once your name's there, keep your fingers crossed & wait for results to be announced! Hurry as contest ends on 30th Nov 2010 at 2359h! Thanks for letting me know, Shirley. Wow....that looks like great bag to have! I have juts followed your instruction above. Now...hope luck comes my way :D Have a great weekend. That is one organized bag, Shirley. You are too funny. So glad we were able to meet. I like. I like! Shirley...you are so sweet :) Wish everybody luck! you are a pretty... done my vote..
what a great bag- looks helpful! Good luck on the contest, Shirley. I just voted for you :). Have a wonderful week. Thank u all, for your votes & good luck to u too! Xin Yun & Jordan, thks so much & let's keep our fingers crossed!